Today, brief reviews of two white florals: Michael Kors Suede and Keiko Mecheri Soussanne. It often puzzles me why perfume brands choose the names they do. At the very least, they seem to assume that consumers are paying very close attention — an assumption that seems entirely unwarranted given the number of new fragrance releases every year. So, if you assumed, reasonably enough, that the new Suede by Michael Kors was a soft leather fragrance, sorry, you were quite off base. If you knew enough to recognize the bottle design (see below), and figured based on the bottle that it was a flanker to the brand's signature fragrance from 2000, Michael by Michael Kors, you were closer to the mark, and if you guessed further that it was a softer, lighter, more summery version, with no relationship to "suede" other than being soft, ding ding ding: you win the prize. Suede, like Michael, is a tuberose-centered white floral. It's less lush and creamy, less spicy, maybe a little more watery, certainly cleaner and less bold than Michael. It's bright in the early stages, warmer, with a good dose of "sun warmed skin", in the far dry down. Personally I found it easier to wear — I've always liked Michael better from a distance than on my own person. Suede is pleasant and nicely done, and definitely worth a shot if you already like Michael, or if you still haven't found your perfect summer white floral. 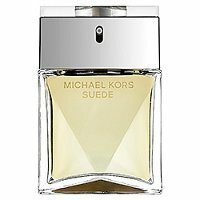 Michael Kors Suede is a limited edition; it can be found in 50 ml Eau de Parfum, $75. The notes include mandarin, orange blossom, waterlily, violet leaves, jasmine, tuberose, michelia, gardenia, sandalwood, plumeria, musk and cashmere woods. Nearly anyone smelling Suede and Keiko Mecheri's Soussanne next to each other would immediately pick out the niche entry. That's not to say that Soussanne is better, but it's done in a very different, more naturalistic style. It's advertised as a powdery lily, and that's sort of what it is, although the lily is tempered with the datura flower, which lends a slightly more tropical air. There are also hints of green notes and pale almond. Overall, you will pick out the lily, but it isn't a lily bomb by any means (lily bombs are getting harder and harder to find) and it isn't a rich or heady fragrance in any case. The powder is likewise middleweight, and the base, despite the oud, is not particularly dark. Soussanne is pretty, and has just a bit of an offbeat edge. Still, it is neither as pretty nor as interesting as its price might imply, and I would feel more kindly towards it if it were part of the "regular" Keiko Mecheri line instead of the über-luxury Bespoke collection. As it is, I very much enjoyed wearing it but will live without it quite happily. I only tried two of the fragrances in the Bespoke series — if you tried any of them, do comment! Keiko Mecheri Sousanne is $275 for 50 ml Eau de Parfum. The notes feature lily, datura, rose, oud, sandalwood and musk. For buying information, see the listing for Keiko Mecheri under Perfume Houses. Note: top left image is Rajnigandha by shankygup at flickr; some rights reserved. Top right image is lily [cropped] by craigie3000 at flickr; some rights reserved. I think it will be interesting to see how these sell. Some brands only work in the upper price ranges, but if you also make less expensive scents, your “luxury” range ought to be noticeably better. To my nose, the two I tried just weren’t. I tested MK Suede off a magazine strip a few weeks ago. At first I really liked it – it actually reminds me of a kind of Amaranthine style white flowers fragrance, but not nearly as rich, gorgeous or “pudding”. I was thinking – hey – maybe this is for me, but then after a while it didn’t sit well. I am reserving full judgement until I can test real juice. It might be OK…. Yes, it’s not really a rich floral. The dry down is far less floral on me, and far more of that musky-ambery-woody “sun warmed skin” thing that is so popular the last few years. I find it pleasant — I’d wear this without qualms — but it’s too common to be remarkable. Still, nicer than many recent department store florals (totally shows up that recent Gucci tuberose thing, to name just one example). Okay, that Suede doesn’t sound like me at all, and I’m grateful for your review. I would’ve thought it’s a soft leather, after all! I really do like a few of them, and own Osmanthus, but the line has grown so huge I can’t even keep up. I don’t think I’ve explored MK as a line at all. Others you recommend? We’re talking the Keiko Mecheri and not the Michael Kors, sorry! I do personally think Michael is the best MK has ever done. I love Keiko Mecheri’s Datura Blanche for its full-on white flower fabulosity. Sousanne sounds lovely too. I’ll have to break down and try a sample even though it’s way over my price point. I love the Suede bottle ! It is very masculine. So much niche, not enough penny exactly sums it up! I have Michael Kors because I got it for a great price unsniffed. It’s pretty but I don’t think I need a flanker of it. It’s too bad the name doesn’t fit the fragrance because Suede is such a great name. Congrats — that’s a lovely coffret.